Is threading preferred over waxing? 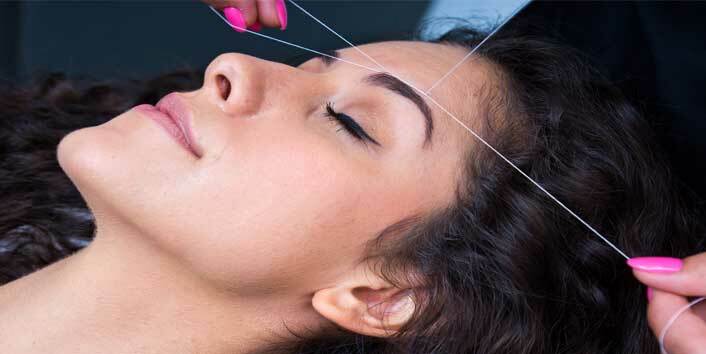 At our parlour we prefer facial threading as it prevents any irritation or peeling of skin layer. Come and experience the magic of our light handed beautician doing your threading. You will be amazed how good it is. You can also bring your friend or family member with you for a full face threading. We can arrange your appointment with your friend. Now it's easy to make an appointment online. You can also mention your preferred time when booking an appointment. Eyebrow threaded by professional beautician is a pain free treatment. Very reasonable rates. Very much a preferred eyebrow technique over Waxing. Call today to make an appointment. Best place for eyebrow shaping which is local to Forest Hill Chase and Knox City. Our clients have given positive feedback and reviews about our service. Threading also know as khite or fatlah is an ancient and well know practice of removing hair from the eyebrows, chin, upper lips and facial area. Our prices are very reasonable and YES, it is pain free!!! Get perfect shape and finish for your eyebrow by removing unwanted hairs from your brow. A perfect alternative to waxing which may cause skin irritation. We maintain hygiene by disposing the thread and other materials used. You can also read what our clients say about our service from our clients section. Facial threading is an art and we pride in doing this art very well. Get your eyebrows massaged done at the end. We have a large satisfied client base in Melbourne. Use tweezers for removing eyebrow hair will be painful and often does not attend good shape. Experience the easy and pain free hair removal of unwanted hair using threading. Organic Threads: At our beauty salon, we also offer organic threading which is made of organic cotton free from chemicals. The end thread product is environment friendly and also friendly on skin. 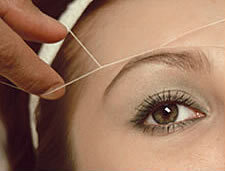 Ask us about the details on this organic threading and what benefits it offer. If you are looking for Brow Salon close from Knox City, then head to Naaz Parlour. Conveniently located in Forest Hill. Friendly and homely enviornment, you will definitely love having your brows done regularly from Naaz Beauty Salon. Indian Beauty Salon in Melbourne also offering Full body Waxing, Facial, Hair Cut, Pedicure, Manicure, Hair Spa, Hair Smoothening, Hair Rebonding and other advanced beauty and hair treatment. Eyebrow threaded and shaped is a very much a pain free process and yes threading is always preferred over waxing. There is no chemical being used close to sensitive eyes. There is no itching or sticking feeling. It is a natural and very trusted process of removing hair from eyebrows.